Mothers come in all shapes and sizes. Some of them need fattening up and others shall we say, are delightfully cuddly and we want to keep them that way. And once in a while it is nice to take them out somewhere special. It could be Mothers' Day, a birthday or just to say "I love you and want to spend some quality time with you preferably over abundant cakes and a cup of Earl Grey." Here are some of the best places to enjoy high tea with your Mum. The Gables, is a stately Queen Anne Style home in East Malvern. But you could be on Long Island as it is all so very Great Gatsby. There is a wide porch with potted palms and 1920s cane furniture. Inside are stunning lead light windows, crafted timber detailing, and chandeliers hanging from high-up ceilings. Various rooms radiate out from a central reception hall in which sits a white-damasked table groaning under multi-tiered displays of cakes, pastries and sweets. while you daintily nibble at ribbon sandwiches, savoury pastries and scones served with a fabulous selection of loose leaf teas from a personal plunger placed before you. 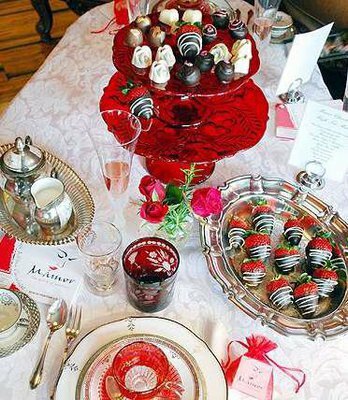 This is followed by helping yourself to the buffet with its piles of colourful macaroons, gold cones piped full of chocolate, fruit parfaits, and cupcakes iced in pink and gentle green. All very opulent. Gluten free options available. 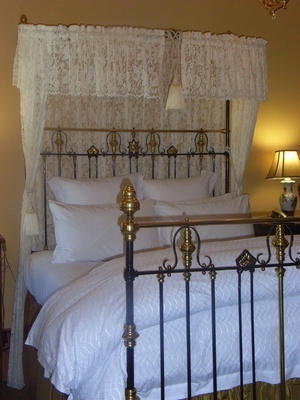 Craig's is a recently renovated grand hotel originally built during the gold rush days. Prominent guests have included Queen Victoria's sons as well as King George V, Queen Mary and Edward VIII, Mark Twain, Nellie Melba and Robert Menzies. The new owners spent millions on the renovations in 2010 now the old lady is grandly stylish again. High tea is served, in what was originally a ballroom, amidst tapestry wall hangings, antique furniture, potted plants in huge Edwardian pots and vases of fresh flowers. The customary glass of champagne is followed by the traditional three tiered stand - moving upwards through an assortment of smoked salmon, cucumber, dill and caper and lettuce and herb sandwiches, dainty quiches, homemade scones with cream and organic jams and then ever upwards to the crowning glory of petits fours such as lemon meringue tartlets; chocolate hazelnut truffles; orange and poppyseed friands and various other delights. 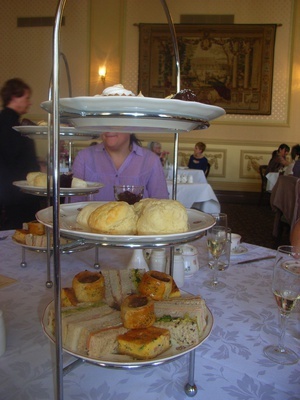 Afternoon teas usually include a free tour of the historic hotel. Sunday high-tea sessions are at 3:00pm. Where: 10 Lydiard Street. 70 mins drive from the CBD or a 1 hour and 20 minute train journey from Southern Cross station. 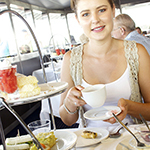 An unusual way of having high tea is on board the Queenscliff Sorrento Ferry. It is served in a room known as the Portsea Lounge. There are lovely white tablecloths and china cups. During the 40 min crossing you can indulge in a high tea of finger sandwiches, cakes and desserts served with freshly brewed tea or expresso coffee and/or sparkling wine. Through the windows you can watch the spectacular coastal scenery with its lighthouses, historic fortifications, cliff top mansions and marine life such as dolphins, seabirds and occasionally whales.While this is certainly not a sensational high tea such as The Gables, the novelty factor and superb views make it well worth considering as a unique way to entertain your mother. Bookings essential. March 31st, April 28th, May 26th, June 30th, July 28th, August 25th, September 29th, October 27th & November 24th. April 14th, May 12th, June 16th, July 14th, August 11th, September 15th, October 13th & November 10th. 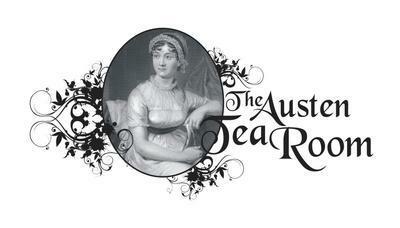 The Austen Tea Room is in a lovely old house in a swank part of Essendon, in the midst of wide tree-line streets. The old home has lovely polished floorboards and rooms off a long hall which have been turned into little private tete a tete rooms spaces where you can get together with a family group. 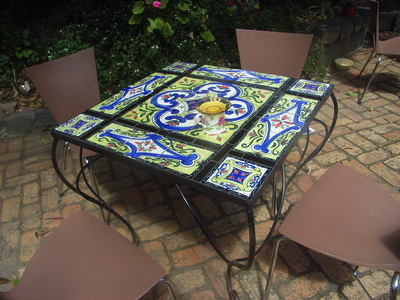 Tables are set with pretty china and gorgeous embroidered table cloths. White and pink are the colours of choice here. 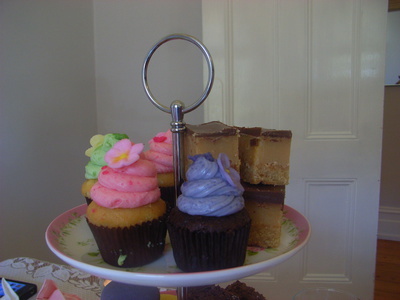 The afternoon tea is abundant, a veritable waterfall of goodies on the usual three tiered stands. Delightful ribbon sandwiches with moist fillings such as herbs, egg and smoked salmon, dainty quiches, sausage rolls and a sundry of other savouries. Fruit scones with baubles of bright red cherries, poking out of them. Then a top layer of cakes. All that is missing is Mr Darcy but perhaps you left him at home. Mamor is the very epitome of indulgence. 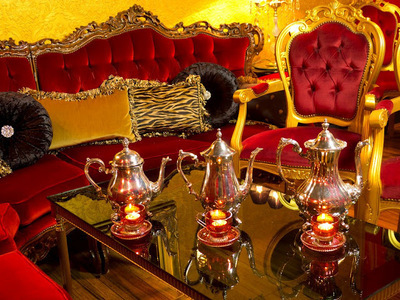 It is the crimson hidey-hole of luxury high tea served on plush red velvet seats with chandeliers glittering overhead. The food is elegant; perfect scones with luscious home-made jams, luxuriant cakes and speciality chocolates. Dr Hannah Frederick has a PhD in food chemistry which she has fully explored in her laboratory (kitchen) where she experiments with all kinds of unusual chocolate fillings such as rosewater and cardamom, wasabi, feijoa lemon myrtle and aromatic lavender. A never to be forgotten luxury experience with beautiful cutlery, china and teapots. The Light Factory Gallery Tea House is at the back of the Light Factory Gallery, an important local gallery that opened in Eltham in 2010. This place if famous for it Devonshire teas but high teas can be done by arrangement. Goods may be according to the mood of Chris the chef but he has creative flare and good home cooking skills. So it it likely to be some of his fresh baked blueberry or date scones and items such as middle eastern orange and almond meal cake, citrus tart and Chris' famous chocolate brownies There are comfortable couches and quiet corners plus seating in a gorgeous courtyard outside, which has a constantly changing display of outdoor sculptures and art work. Where: 21 Brougham Street Eltham. Cost: $29.50 for three indulgent courses, but you need to book ahead. 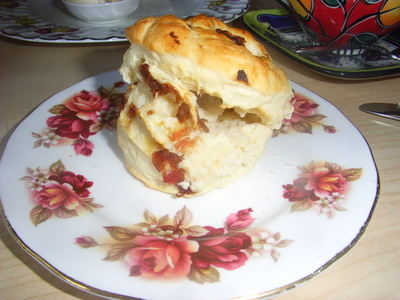 If you know of any other unusual places for high tea please let others know in the comment section below. Will definitely try some of these next time we're in Melbourne. Thanks for a great article. 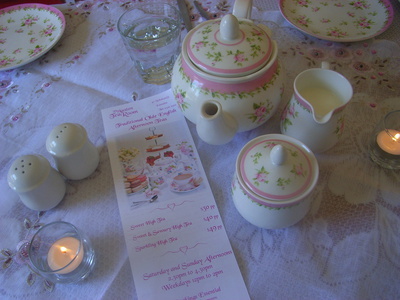 A nice idea to sit down and do some knitting and enjoying some high tea. Apart from the place in Malvern, there was nothing for the Eastern suburbs' people. Could you look into this area's great offerings ?